The entries have started trickling in for the COCONUT round of Weekend Wokking, hosted this month by Ivy of Precious Pea. Did you see my entry of Banh Dua Nuong (Vietnamese Coconut Tartlets)? If you've got a recipe featuring any type of coconut, please come play! Rita of Pink Bites' entry of a tropical parfait featuring mangoes, toasted coconut flakes, and frozen yogurt reminded me of these banana and coconut frozen yogurt popsicles I had made earlier this summer. This recipe started out as an attempt to recreate Thai caramelized bananas with toasted coconut flakes that I made years ago. But my bananas were too ripe and fell apart. So I added in some plain yogurt and was going to make my Homemade Frozen Yogurt with it instead. But then I forgot about it in the freezer so it solidified. Added all the events together and a light bulb went off. 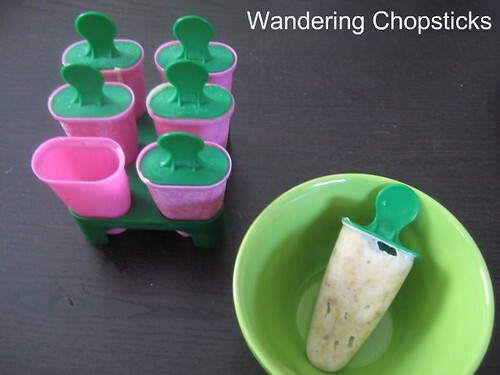 I let the mixture melt, filled my popsicle tray, and made these banana and coconut frozen yogurt popsicles. 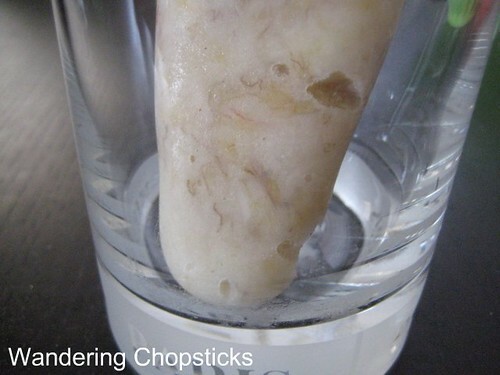 If you don't have a popsicle tray, you can fill the mixture into ice cube trays and insert toothpicks, or fill small paper cups and insert a bamboo skewer. Toast 1/3 cup coconut flakes in a dry pan on the stove top until it becomes slightly golden. Set aside. Melt 2 tblsp sugar and 2 tblsp butter in a pan until it starts to thicken. Add the banana and let it absorb the sugars and caramelize. Then turn off the heat, add the toasted coconut flakes and mash everything together with a potato masher. Let the mixture cool down in the fridge. Then add one or two 8-oz containers of plain yogurt and mix thoroughly. Spoon everything into popsicle makers and freeze. 1 year ago today, no-soak rice paper. This is tailor made for my kids. Thanks for the recipe! This one hits home...I must have been 5 the last time I had this. My grandma takes a ripe banana, put on piece of saran wrap, press/flatten lightly, pour on thick coconut milk, toasted coconut flakes & peanuts... then wrap up tightly, place in freezer. No popsicle holders - I think we were too poor at the tiem to have such a tool. ahhhhh...I can still see her making it in my mind, but I have not had it since. You should make some for me! I used to make Ribena Popsicles when younger! From all things I make in kitchen, homemade popsicles is just not one of them. Shame on me! These looks insanely delicious!!! WeekendWokking, okay..I was hoping to chime in, let's see..coconut coconut! I still have few days - chop chop chop. i am all about popsicles these days...when is it gonna be really autumn in hk? sob sob...i am literally melting! hmm..the layout seem to have some subtle changes? I have to hide this post frm AR! He is such a coconut fan that he will probably drool over the computer. I'm ok with coconut but not sure if I will like it in an ice-cream though. Have to say that I have taken a fancy towards coconut cream/milk these days. Yes, coconut milk counts! I hope you submit something. You're welcome. It's quick and easy. You can definitely make it even healthier for kids by omitting the butter and sugar. I hope you come up with a coconut dish for Weekend Wokking. It'll be fun to have more participants. It's so hot in SoCal too! Doesn't feel like autumn yet. You can easily omit the coconut if you don't like it. It's not too much so the frozen yogurt and banana flavor still comes out stronger. Great project for kids! I love the cute mold, hehe. I just made these this week and they were AMAZING! Thanks so much for sharing your recipe. I doubled the coconut in the recipe because we love coconut, and the popsicles are just stuffed with it= fabulous! I also added coconut rum to four of them to make a more "adult" popsicle. 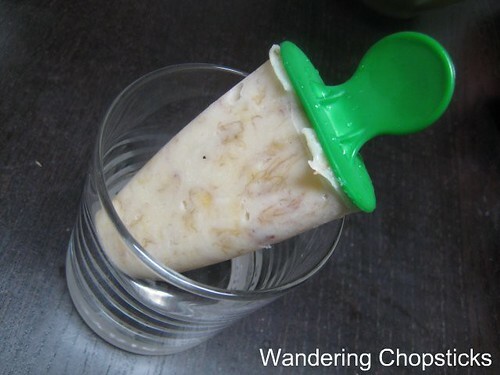 I found your recipe on the TipNut website of the 50 best homemade popsicle recipes at http://tipnut.com/homemade-popsicles/. I am going to attempt to make a lot of them this summer, I am excited! Thanks again! Thank you for sharing your recipe. I strain the yogurt to make it creamier but all in all this recipe is amazing. It has just the right amount of sweetness. Straining the yogurt is a great idea to make it thicker.